Pat Sklenar's kit preview of Comet's 12" Discovery. Overall Rating: Small. Not cheap, mine was about $35 in the US with shipping. On the other hand, all other kits of this subject are significantly larger and more expensive. Roughly one half of the movie "2001: A Space Odyssey" (and much of the movie "2010: The Year we Make Contact") take place aboard or near the USS Discovery 1, more proberly referred to as "X-Ray Delta One". This 12-inch long mixed media kit, produced by Comet Miniatures, is one of only a handful of kits available of this subject. In fact, only two other kits are currently available - a 30-inch long version by Lunar Models and an 18-inch version manufactured by Planet X for and sold by Comet Miniatures. The 30-inch Lunar Models kit is generally considered to be the best in terms of size & accuracy although I haven't been able to find out anything about their casting quality yet. A fourth option should be available in the not too distant future. 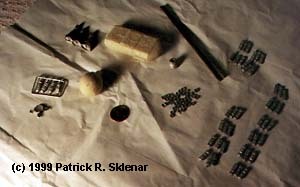 Scott Lowther of Part Time Models is working on a set of all vessels seen in the movie - all in 1:144 scale! At this scale, given his determination of a 700' Discovery, this model is going to come in at nearly four and one-half feet long! Click here for some pictures of his progress. However, if space is a premium, then this 12-inch kit seems to be a more accurate model of the Discovery than the 18-inch one. Habitat Module - 1 piece, resin. Engine Module - 1 piece, resin. 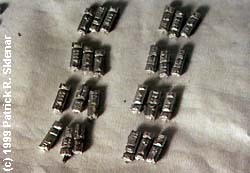 Fuel Modules - 42 pieces, white metal (12 are extras). Communications Complex - 5 pieces, white metal. Backbone - 2 pieces, brass tubing. Engines - 4 pieces, 3 of white metal and 1 brass rod. Other - ?? pieces, white metal rings for mounting Fuel Modules to Backbone (I haven't counted them yet). 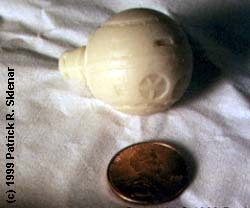 The resin castings are of mixed quality. The Habitat Sphere is solid and clean, with no pits or bubbles. However, the depth of detail fades off towards the very front of the sphere. The top, bottom, sides and rear are crisply detailed, but the front ... <shrug>. 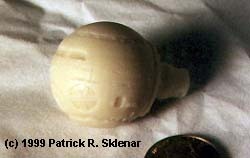 The casting does correctly include the Escape Rockets between the Sphere and the Backbone. The Engine Module is another study in contrasts. The amount of detailing is nothing short of amazing. Unfortunately the Engine Module is also the site of some severe pitting and air bubbles. Part of this casting almost looks like the foam head on a fresh pint of a good stout - very thick and smooth, but made up purely of very small bubbles. There's also some small pieces of a green material stuck in some of the crevices on this module. I don't know if they're from the molds or the release agents. I'll know better when I begin to clean and prep the surfaces. Above and below: The Habitat Module. Note the Emergency Airlock. Note also how the detail seems to "fade out" as you move around to the very front of the sphere. Penny is shown for scale. ^ Fuel Modules. Very nicely detailed and accurate. ^ The Engine Module. Superbly detailed. Unfortunately, also superbly pitted with air bubbles while being cast. The castings of the metal fuel & communication complex modules is simply exquisite. Very clean and crisp. There's some minor flash that'll have to be trimmed away, but that's to be expected. The Discovery was built with 30 Fuel Modules along her Backbone, the kit comes with 42. The modules that make up the Communications Complex are cast seperately and are still on their "sprue". They are quite accurate, with the top module sloping off towards the aft. The antenna is nicely done as well, although the metal holding the two smaller dishes to the complex is very thin and will bend very easy. Unlike the modules above, the three Engine castings are heavily infested with flash. In fact, I'm not quite sure how much detail I'll find under all the flash in the back of the engines. In other words, the exhaust ports are obscured and I'm not sure they are really there under all that metal. No stand is provided with the kit, but instructions for a "recommended design" are included. Painting instructions are basic. White mixed with just a bit of "warm grey", black (or red to simulate lighting) for the cockpit windows and then a wash of medium grey. Issue number 8 (October 1991) of the Australian magazine Science Fiction Modeler. Back issues are available through Tangents Publications in the USA. Last updated on 9 June 1999.